Food can comfort us, nourish us, or be deadly as sin. The 1963 movie of Tom Jones, a rollicking historical comedy, set in Britain during the 1700s is a great example. Albert Finney and Joyce Redman are seated at a table by themselves. They begin their repast. Everything begins proper enough, but soon each bite and lick turns into a seduction. In Tom Jones, the two took it one step over the line until it became foreplay. Ah the power of a turkey leg. I’m a retired personal chef. It was my job to understand how people responded to my menu suggestions. It never ceased to amaze me how specific a person was when it came to their food. To some it’s fuel to keep them going throughout the day, others are addicted to sweets or anything hot and spicy. And then there’s chocolate—need I say more? Food can also be a guilty pleasure. My weakness is for little powdered sugar donuts. Don’t ask why. I couldn’t tell you. Being a former personal chef gives me a chance to use what I know and throw in a bit of murder for fun. Chefs handle knives, rolling pins, whisks, and other utensils which can whip up an omelet, or take out a killer. A kitchen is a deadly place to make a wrong move. This was supposed to be a cozy—a nice little book about chefs who solve crime. Instead, it turned into a spicy mix of humor, mischief, and danger. Between watching all of the ‘foodie’ and forensic shows, is it any wonder this book evolved into a romantic suspense with a big helping of death? I once told a writing panel that I wasn’t satisfied with my books unless three to four bodies hit the floor by The End. Celebrity Tilly Danes and Jordan Kelly aren’t above taking a few competing potshots at each other. If their taste in food is different, so is their approach to solving murder. Tilly leads with her heart, Jordan goes with the evidence, but the opposite holds true in romance. Jordan finds himself drawn to the prickly Tilly – she doesn’t trust her judgment when it comes to men. 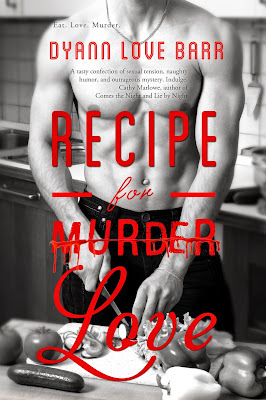 They are thrust together to find the right recipe for love, and identify a killer, before it’s too late. If they don’t they may be next on the murderer’s menu. Everyone is a suspect: the show's host, the contestants, and even the victim's lover. When Tilly and Jordan are pulled deeper into the investigation, those pesky sparks of antagonism transform into undeniable, incredibly inconvenient, red-hot attraction. And if they thought the sparks were hot while fighting, the heat between the sheets is an inferno. As the bodies start piling up, Tilly and Jordan must find the killer—and a recipe for love—before they become the murderer's next course!